Have you ever found yourself in the supermarket grabbing a pack of bacon jerky, but eventually, you end up returning it in the rack because it is too expensive? This is too frustrating. The good news is that you can make one at home and save a lot of money. Read this guide and we’ll let you know how to make bacon jerky in different ways and various flavors. A dehydrator is one of the most useful tools in the kitchen. It makes use of heated air flow, which in turn, will dry the food that will be placed inside. It has an adjustable thermostat that you can customize depending on how dry you want the meat to be when making a jerky. Cut bacon into small pieces, at least an inch in length and half an inch in width. Using a skillet, fry the bacon until it becomes crispy. After frying, place it in a paper towel, which will absorb the oil. Let it sit for a while or until a lot of oil has been drained. In a drying tray, place a solid sheet on the surface and arrange the bacon. Once it is arranged, place it in the dehydrator. Turn it on and after a couple of hours, take it out, drain the excess oil again and put it back in the dehydrator. The length of time will vary, depending on the dehydrator you are using. More often than not, this should be 6 to 8 hours. Take out the bacon from the dehydrator and pack it as desired. For a lot of people, they do not have a dehydrator in the kitchen. Not only because they find this to be an expensive investment, but they also do not think that it is going to be useful, especially if they are not into a lot of food processing tasks. In a large bowl, combine ground turkey, minced bacon, liquid smoke, Worcestershire sauce, salt, and ground pepper. Place it in a zip-top plastic bag. Cut the edge of the bag. In a baking sheet, put parchment paper on the surface. Twist the top of the zip-top plastic to make strips of meat. Roll it out until it becomes flat. While doing all the prep work, pre-heat the oven to 160 degrees. Once it becomes hot, put the baking tray inside and roast it for about two hours. Check it every half an hour to make sure it does not get burnt. Once the strips are ready, dry it with a paper towel to remove excess moisture. Let it cool for about half an hour. Package it and keep it in the fridge until it is ready to be eaten. This is another easy solution to make bacon jerky without an expensive dehydrator. The grill that you usually use for barbecue parties during the summer months can be put to good use and can help you make your jerky easily. Start by lighting fire on your coal and wood. Once it gets hot enough, you are ready to start smoking your choice of bacon strips. Arrange bacon evenly on the top of the grill, making sure that each strip will receive even heat. Make sure that the bacon cooks, but it should not crisp. Turn the strips around once grill marks start to appear on the other side. Pat it dry with a paper towel once the bacon strips are cooked. Once it is dried, smoke it for about two hours at a temperature of 170 to 200 degrees. Take out the bacon once it turns out dry and stiff. You are now ready with your jerky! Below is a short video clip that explains how to do this. Pro Tip: Cherry wood is highly-recommended. While you can use other types of wood, cherry is best because it burns slow and it comes with a distinct flavor. To start, preheat your oven to 180 degrees Celsius. On a baking tray with sheets, lay down the bacon strips. Make sure they are laid evenly so that they will receive the same amount of heat. Do not stack them above each other. Grind black pepper on the top. The amount of black pepper added will depend on how spicy you want the jerky to be. Place it inside the oven. This time, adjust the temperature to 80 degrees or whatever is the lowest setting of your oven. 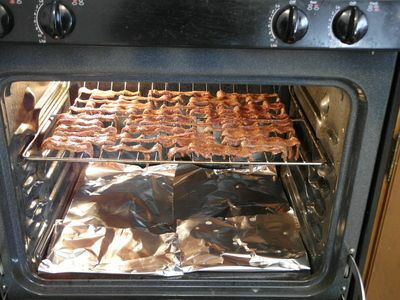 Bake the bacon for about two hours. Check it occasionally to be sure it won’t end up being burnt. Once it is done, let it cool at room temperature and enjoy. You can also package it in zipped bags and store in the fridge. Mix one cup of brown sugar for every pound of bacon. Mix it by hand so that sugar will be distributed evenly on all the bacon strips. You can lessen the amount of sugar that is used to make the jerky suit the sweetness that is preferred. Lay down the bacon strips on the dehydrator trays. Make sure that it is spaced out evenly so that there will be enough air to circulate. Start dehydrating at 160 degrees. Let the bacon strips dry, which will remove all excess moisture. This is one of the most important properties of jerky. You can dry it for 36 to 60 hours, depending on how much time you have. Choose bacon strips that are lean. If there is thick fat, this will lead to more oil and moisture. The outcome is that it will take longer before it can be completely dry. By now, we hope that you learned from the tips mentioned above on how to make bacon jerky. It does not need to be a complicated process. Whether you have a dehydrator, oven, or a grill, you can make delicious, tasty, healthy, and affordable jerky at the comfort of your own home. Have you tried making your own version of bacon jerky at home? How did you do it? Feel free to leave a comment below. I love Bacon Jerky and thanks for sharing this recipe !